The first blog in this saturation masks series reviewed why Photoshop’s HSB/HSL filter is NOT a good way to create saturation masks because it consistently overstates the saturation of dark colors in the image. This post will review the method to make “true” 16-bit saturation masks that accurately map saturation in both light and dark colors. This results in perfectly feathered saturation masks for all colors in the image at all brightness levels. The best methods for using these true saturation masks, and their vibrance mask counterparts, will also be discussed. The video at the bottom of this blog reviews all the information on saturation and vibrance masks in this and the previous blog. The image below is from the video. To see its true saturation mask, roll the mouse over the image. (The mask may take a couple of seconds to load and the rollover might not be visible in the email feed.) Notice how just the most saturated colors (orange clouds) are light in the mask. Unsaturated and dark colors are dark in the mask. Colors of intermediate saturation (blue in the sky) are shades of gray. This is a very accurate saturation mask, and it’s the starting point for making adjustments to control saturation that are equally precise. NOTE: The Granger Chart image will also be used in this blog. Copies of these images are included in the assets download folder for this blog. There are good reasons for wanting to make saturation masks better than those created by the HSB/HSL filter. The primary one is accuracy. Creating saturation masks that properly reflect pixel-based saturation makes it very easy to use them to modify saturation in the image. Increasing or decreasing saturation, either globally or locally, can be precisely controlled once an accurate saturation mask is available. Many people have found HSB/HSL saturation masks less than useful because they end up with masks that include too many unsaturated dark colors. Inaccurate masks lead to flawed adjustments. Once a precision saturation mask is available, though, saturation adjustments become a standard part of the workflow since they offer consistent, predictable results. Another reason to make a better saturation masks is to aid in decision making. An HSB/HSL saturation mask is so obviously inaccurate that it’s hard to decide whether or even how to modify it to make it work. Once true saturation masks are available, it’s easy to quickly look at them and decide which one to use or how to make an adjustment to the mask to make it fit the image. True saturation masks are actually quite easy to make, though the method is not entirely obvious. Start with a Selective Color adjustment layer and set the color change to “Absolute” in order to make sure the necessary adjustments are independent of the amount of color actually present in each pixel. Then for all the colors in the “Colors:” drop-down menu (Reds, Yellows, Greens, Cyans, Blues, Magentas), move the “Blacks” slider all the way left to -100%. 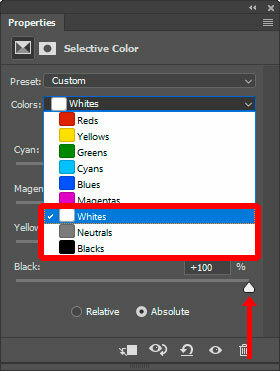 For all the non-colors in the “Colors” drop-down menu (Whites, Neutrals, Blacks), move the “Blacks” slider all the way right to +100%. This Selective Color adjustment drains all the color from the image. So it’s now essentially a gray-scale image even though it’s still in RGB Color mode. But this gray-scale image is what the true saturation mask looks like. In order to make an actual mask of it, simply duplicate any of the color channels on the Channels panel since they’re all identical at this point. 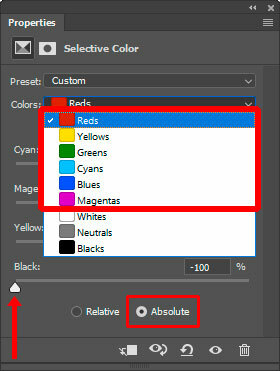 Once the duplicate channel is available, the actual Selective Color adjustment layer used to create it can be deleted. A Photoshop action to complete these steps is included in the assets download for this tutorial. This duplicate channel is the true 16-bit saturation mask. This is the process carried out in the background when the RapidMask2 module creates a saturation mask. It results in a very accurate saturation mask that can be further modified using the buttons on the panel if adjustments are needed to better target specific colors or parts of the image. The image below shows the Granger chart with its true saturation mask. Notice the smooth transition from saturated to unsaturated colors in both the light and dark tones in the image. Saturation masks, however, are really only half the story. Just like there are two main types of luminosity masks, lights and darks, there are also two types of saturation masks: saturation and vibrance. And, again, just like with luminosity masks, they are the inverse of each. Inverting a saturation mask creates the vibrance masks, and both masks are useful when balancing saturation in an image. However, knowing which technique to use is important. TECHNIQUE TO USE: Saturation painting through a saturation mask. RATIONALE: Usually there are just isolated areas of over-saturation in an image, often as a result of aggressive processing. Rather than making a global saturation change to correct this, it’s often easier, and more precise, to simply paint it away with saturation painting. This is the equivalent of dodging using luminosity painting and is described in more detail in this tutorial. Create a blank pixel layer set to Saturation blend mode. Create a true saturation mask and load it as a selection. Select the brush tool and set the foreground color to gray and the opacity of 5 to 10%. Paint through the active selection on the over-saturated parts of the image. The active selection of the true saturation mask will restrict the paint to landing on just the most saturated areas of the image, partially removing saturation in the process. Add additional brushstrokes until the desired level of saturation is achieved. WHY IT WORKS: Saturation blend mode combines the saturation of the saturation painting layer with the hue and luminosity of the underlying layers. Gray paint has a saturation of 0%. So if gray paint is painted on the saturation painting layer at 100% opacity, the result would be that the underlying color would now be 0% saturated. In other words, all color would be removed. Painting with a brush opacity of 5 to 10% means that the saturation of the underlying colors will be decreased proportionally. A true saturation selection can be used to expertly confine the paint to just the most saturated colors in the images. Painting through a saturation selection with a low opacity brush and multiple brush strokes then provides a very controlled method for lowering the saturation of just the over-saturated parts of the image, which are defined by the active saturation mask selection. TECHNIQUE TO USE: Use a Hue/Saturation adjustment layer with a vibrance mask as the layer mask. RATIONALE: Under-saturation in an image is often more global. The image simply looks dull when it doesn’t have enough color. While additional saturation could be painted in with saturation painting (by painting with saturated red instead of gray through a vibrance mask), large parts of most images can usually benefit from a global increase in saturation as long it’s restricted to less saturated colors, which is exactly what a vibrance mask does. So it’s often better to do a global adjustment with an adjustment layer rather than a precision adjustment with a paintbrush. Create a true vibrance mask. The initial vibrance mask will usually be too revealing, so narrow the range. I like using a Zone 8-½ or Zone 9 vibrance mask as my starting point for enhancing under-saturated colors. Create a Hue/Saturation adjustment layer with the chosen vibrance mask as the layer mask. Open the Hue/Saturation properties and drag the saturation slider to the right to achieve the desired degree of saturation across the image. WHY IT WORKS: The vibrance layer mask insures that the adjustment only targets the less saturated tones in the image. More saturated colors will NOT receive the adjustment so they won’t over-saturate with this process. The saturation boost only affects dull colors in the image because the vibrance mask controls which pixels are affected. SUMMARY: True 16-bit saturation masks are easy to create with a Selective Color adjustment layer. Once the initial saturation mask is created, it can be inverted to create a vibrance mask. With these two masks, there are two main methods for balancing image saturation. Saturation painting with gray paint through a saturation mask is a precision method for addressing over-saturation of specific colors or elements in an image. A Hue/Saturation adjustment through a vibrance mask is a great way to bring additional saturation to under-saturated tones while sparing more-saturate colors from the adjustment. Saturation changes to an image can be subtle, but I usually experiment with both techniques when the image is nearing completion. It’s often surprising how specifically addressing saturation in this manner can improve the image. It’s worth remembering that saturation and vibrance masks made with the Selective Color adjustment are pixel-based masks, which makes them completely self-feathering. This means that any change you make using these techniques always blends seamlessly into the final image. The video below reviews and demonstrates all this information about saturation masks. If you would like to practice along, a jpg of the image used in the video is located in the assets download. Thank you Tony, it’s helpful to read the details of just how the two masking techniques work and how easy using the RapidMask2 makes it to apply them. My pleasure, Mike. I’ve been wanting to get this out for awhile as saturation masks probably don’t get the attention they deserve. While luminosity masks can certainly do a lot for an image, there is a unique role for saturation masks also. Thank you, Tony. I found your PDF and video extremely useful and easy to follow. I look forward to more explanations and applied use of the TK rapidmask2 V6 panel. Great work! The current panel format works very well but please don’t change it for a while as it takes a while to get used to where icons exist. Still, the perfect tool for subtle masks to enhance images. Thanks for the feedback, David. No radical changes are planned for the V6 panel. This compact, top-to-bottom workflow for masks seems about ideal. You get one shot at it so use it wisely, it’s the Image Fade effect, that allows you to control the opacity strength of the saturation applied, it’s usually a forgotten step that can offer extreme control, when used effectively. I’ve not used this, Randy. At least not recently. I use the layer’s Opacity slider if I want to fade or decrease the effect of any specific layer. As I recall, the Filter menu used to have a “Fade” command, but with Smart Objects, it wouldn’t be necessary since they allow you to change the filter settings as many times as you’d like. Neither Opacity or Smart Objects are one-shot deals, which is important in a non-destructive workflow. I don’t see the Fade option anymore in the either the Filter or Image menus. I know I’ve not used it for many years and have lost track of it. To be precise, it’s listed under – Edit – Fade Brush Tool in Photoshop, try not to forget it. Yes, there it is! It’s now under the Edit menu. I’m almost positive this was under the Filter menu when I last used it. It appears to be able Fade anything done previously, like brush stroke, and not just filters. However, I’m still not convinced it offers much advantage over other Photoshop methods. If I screw up a brushstroke, I’ll like CTRL/command-Z and just repeat it rather than guessing at the fade percentage. However, the option to use a different blend mode in Fade might have some utility. As I recall I used to do my sharpening and the fade in Luminosity blend mode to counteract any color changes that resulted from the sharpening process. Beyond that, though, I don’t have a lot of experience using this option, and have not used it for several years now. And I really don’t have a sense for which blend mode to choose for fading. Beyond that, though, the whole one-shot concept simply doesn’t have much appeal to me. I often don’t know for sure what I want until I see the image actually printed. I’d rather have ways to try alternatives based on my how my print looks and not have to make a one-time decision that I can’t go back and change. But I also understand there are many ways to the same end in Photoshop, and I’m a big believer in developing whatever techniques work for you and applying them to reach your desired goal. I’m sure there are plenty of photographers that use Edit > Fade as an important part of their workflow. It’s just not something I’ve pursued. You’re right Tony there are many ways to work around at achieving one’s goals, I only mentioned this as an extra one should be considered as an aid when working. Thanks! Thanks, Randy. I’m sure there will be folks that find it useful.